On the last day of shiva, this past June, we got a letter in the mail. 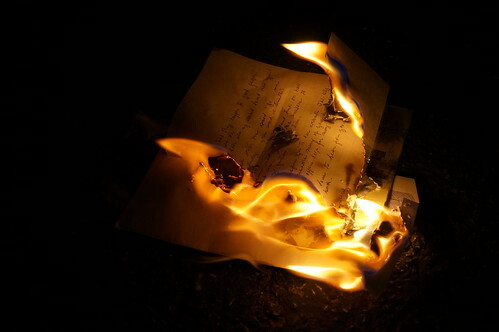 Just by looking at the envelope, I could see that it was a note of condolence, and from a nearby address to boot—yet the name was entirely unfamiliar. When I opened it, I discovered a handwritten note that started with a perfunctory condolence and then immediately turned to extended proselytizing. Enclosed was a religious tract specifically about the afterlife. From the actual text, it was clear the person who wrote it didn’t know us at all, didn’t know the first thing about us or what we had just gone through. They had simply trawled that week’s obituaries to get our names and address, and proselytized by mail. I wish I were making this up. But no, someone really did decide that the occasion of our daughter’s death was the perfect time to thrust their religious recruitment efforts into our lives. Artisanal bereavement spam, basically. I tweeted about it, leaving out identifying information, but otherwise let it go. An unfortunate one-off, I figured; someone with more fervor than sense, not to be taken as representative of the group as a whole. Except it just happened again. Different person, same religion, same basic approach. This letter isn’t as glaringly obvious about the obituary trawling, no hollow claims of sympathy or condolence this round, but the handwritten emphasis on seeing dead loved ones again makes it pretty obvious that this is of a piece. So, yes. The Jehovah’s Witnesses apparently think it is a fine idea to vulturously circle the misery of others and then swoop in to deposit a load of tract on the dining room tables of grieving families. And what’s more, to keep doing it. I disagree. I don’t even beg to differ, I simply disagree. If there were an opt-out mechanism, I would most certainly make use of it. In so doing, I would include a number of comments regarding their apparent need to hide their intent with misdirection and to prey on the extreme pain and emotional vulnerability of others. Since no such mechanism appears to exist, this post will have to do. Of course, just as I did the first time this happened, I handled the note, the tracts, and the envelope itself with every bit of the care and respect they deserved. 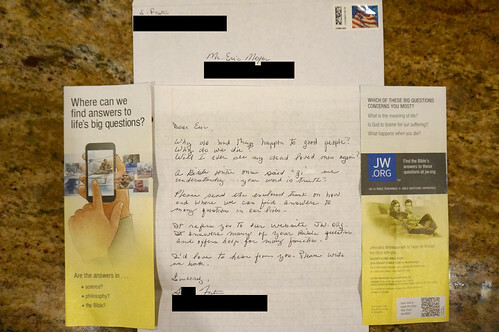 I Googled around a bit and only found two posts about this practice (“Are Jehovah Witness Members Trolling Obituaries for New Recruits?” (2009), “Letters from Jehovah’s Witnesses” (2013). Well, here’s a third, this one backed up with visual evidence. I’m posting this in case others experience the same thing and wonder if they caught a lone crazy. I’m sorry, but no, they aren’t “lone”. If you got one, you may well get more. I very much wish it were otherwise. I cracked last night, and I mean that two senses: that of a structural crack, and a crack of the whip. Over something admittedly important, yet still not immediately critical, I just lost it. Angry lost it. I yelled at my wife and child, at the top of my lungs, my voice cracking, venting frustration and rage. I ended up leaving the house for a while, right in the middle of bedtime, because if I’d stayed I would have kept making things worse. Part of me feels like I failed them and myself, because I was adding to the stress and upset of loved ones. It radiated outward, a wave of anger passing from me to them and from them to others in the house. We don’t need any more upset than we already have. I shouldn’t have been the flashpoint. I expect more of myself. But more of me, maybe most of me, knows that strength always has its limits, and that last night, I reached mine. There were too many weights from too many sources, and I broke. It was, perhaps, understandable—the breaking, and maybe even the manner of breaking. Whether you think the manner of breaking was okay probably depends a lot on the kind of household that raised you. Some families think yelling in anger is merely a louder form of conversation. Others think it’s a fundamental betrayal of respect, trust, and love. The calculus often changes if children are involved, and how involved they were in whatever precipitated the anger. I’m not here to ask for absolution, nor to be condemned. Nobody else could do that anyway. Only I know all the specific pressures involved, the mitigating factors, and the paths not taken. I’m more than capable of judging myself and my actions (and inactions), and deciding whether I deserve harshness or leniency. Or some combination of both. I might err a little bit on the side of harshness; I always have, when it comes to me. If anything, the past nine months have pushed me away from that. Afterward, when the kids were (mostly) asleep and I had returned home, Kat and I talked, and I set a limit I didn’t want to set, but had to set. I said exactly that to her, that this was not something I wanted, that I actually wanted the opposite, but it was something that I had to have, or else I would just keep breaking, day after day. I asked forgiveness for what I was saying. Asked us both for forgiveness, really. She gave me hers. I’m still working on fully getting mine, but I will. Because blogging is a heavily filtered view of reality, just like any other medium. Here, I choose what to share, what to hold back, and what to lie about. I do my best to avoid the lying, but to some extent it’s unavoidable, because I’m not going to record every conversation and every incident in precisely the way it happened. Not even documentaries do that; every jump cut is a falsehood, by omission if nothing else. It’s too easy to edit out the rough patches. So many people keep telling us how strong we are, how amazing, how incredibly we’re coping with all this. There’s a sort of imposed romanticism about it. I’d always noticed, before we had cancer or even kids, that stories of people who discover they’re dying always get an aura of nobility applied to them. In the shadow of death, the victim somehow always attains a special glow, one that spreads to those nearest them, bathed in a light of wisdom and clarity and rightness. And I’ve fed it. I’ve fed that aura in our own story, in what I’ve talked about and how I’ve presented it. I didn’t consciously set out to do it, but it’s there. I read back through the archives, and I can see it. I shared the best parts, and skipped the bad parts; or, when sharing the bad news, did it in a way that made us, all of us, seem strong, amazing, incredible. Maybe we are all those things, but we’re human. Flawed, struggling humans, just like everyone else, just as prone to error, just as capable of hurting loved ones with our words and outbursts. Inside the aura, there is no nobility. We don’t get a special, knowing inner light. There is no melancholy beauty, no surplus of grace. We don’t get bonus abilities. We have more help than anyone could ever dream likely, all the hundreds people who lend and have lent their hands, their ears, and their encouragement, and still we struggle imperfectly with ourselves and each other and the demands we must meet. We’re human, with every drop of beauty and ugliness that label carries with it. The angel and the demon, all rolled up together. We cry and we crack, inside and outward. We stumble and fall and fail and flail. We simmer and seethe, and also we soothe. We give and forgive. We hold to each other and hold ourselves tight. We do what we can, as best as we can, as long as we can. And when we falter, we patch the cracks as best we can, make our apologies, and try again. That’s what keeps our failings from making us failures. We try again, one day at a time. That’s not noble. It’s not even all that remarkable. It’s simply what has to be done, over and over. Just like everyone else. Not surprisingly, there was a lot of community feedback asking for better layout mechanisms. Actually, people were asking for any decent layout mechanism at all, which CSS has historically lacked. Floats mostly work, but they’re a hack and can be annoyingly fragile even when you ignore old-browser bugs. Positioning works in limited cases, but does not handle web-oriented layout at all well. Why do we use floats for layout, anyway? clear. That’s pretty much the whole answer. The unique in-flow/out-of-flow nature of floats means they interact with each other and with the normal flow, which means they can be cleared, which makes them useful. Because with clear, we can float layout blocks around and then push other non-floated blocks, like footers, below the floats. Positioning, of course, permits total layout freedom in the sense that you can put a layout block anywhere with respect to its containing block. The downfall is that absolutely positioned elements are entirely out of the normal flow, so they can’t stay out of each others’ way like floats do, and you can’t clear anything with respect to a positioned element. If there had been a position-clear or its equivalent from the outset, we’d never have bothered with floats. There are no equivalents in CSS. There have been various very clever attempts to replicate bits and pieces of those capabilities using CSS. What CSS does, it does very well: if you don’t need equal-height layout blocks, then no problem. If you do, it’s a massive pain. Clever techniques provide substitutes, but can’t replace what tables already do. And please, let’s put the whole “display: table-cell will grant those abilities through CSS” to rest. Saying that is just saying “use tables for layout” with different words. Turning a bunch of divs or list items or whatever into table-role boxes is no better than just using table markup in the first place, and it’s arguably worse. Using element names other than table and td to create layout tables, and then claiming it’s not using tables for layout, borders on self-deception. Not to mention doing things that way means you’re doing your layout in a highly source-order-dependent fashion, which was one of the things about table layout we were trying to get away from in the first place. So how do we get really powerful source-order-independent layout? I wish I knew. The Advanced Layout module has been sitting around for a while now, and even if you’re a fan of defining layout as ASCII art—which I find repels and appeals in equal measure, but that’s probably just me—there appears to be close to zero implementor interest. So how do we get those abilities in a form that implementors will, y’know, implement? I don’t know. I don’t care. We just need it, and have needed it for a good decade or so. Without it, CSS is a styling language but not a layout language. We’ve bent it into being something close to a layout language, which is nice but not really ideal. And yes, I just advocated doing this outside the W3C process. Why wouldn’t I? The process has, in the last decade, not produced anything even remotely resembling an answer to this problem. Time to try another path and see if it gets any closer to the goal. If I sound frustrated, it’s because I am, and have been for a good long while. I’m not the only one. It rankles to have CSS be, as Winston Churchill would have put it, the worst form of layout except for all the others that have been tried. It’s not every day I uncover a case involving the botched theft of information about nuclear weapons. Here’s how it went down: in the infosthetics feed was an entry about a video regarding nuclear stockpiles around the world and the effects of a nuclear explosion in New York City. The video was produced by Chimp on a Chain for Good Magazine. That’s a long-standing area of interest for me, so I watched it. When I got to the New York City portion, something started to bother me beyond the obvious horror of the scenario. The point of detonation, the explosive yield, the elapsed-time intervals, the radius distances—all seemed very familiar, like I’d seen them somewhere before. And I had. They were nearly all taken verbatim from the New York City scenario found at the Atomic Archive. I could find only two differences. The first is that the total death toll given in the video is slightly higher than that in the Atomic Archive’s scenario. Otherwise, all the numbers matched up. The second difference is really a major error on the part of the video’s makers: they dramatically under-represent the areas of damage. For example, the ten-second ring’s (found at 2:33 in the movie) radius is labeled with the correct distance (2.5 miles) but the circle placed on the map is much, much too small to be 2.5 miles in radius. The circle doesn’t even cover the breadth of Manhattan Island, whereas an accurate plot would have it stretch across the Hudson River on both sides into New Jersey and Long Island. You can see this in part 5 of the Atomic Archive’s scenario, or on a HYDEsim plot of the same scenario. The video seriously misrepresents the area of damage that would result from such an incident, making it appear much smaller than it would be, and I just can’t fathom how or why they would get that so wrong. Even assuming they mixed up the meanings of “radius” and “diameter” doesn’t appear to explain it. The ring distances shown correspond to a three-kiloton explosion at most, not to 150KT. That’s the botched part. So where’s the theft? There is no credit whatsoever given in the video for the material’s source. There is a reference to the Archive on the video’s page at Good in the “Resources” box, but the material in the video has been used without permission—I checked this with the custodian of the Archive—as required by the site’s policy. Even if one could argue this is a case of not needing permission on non-profit grounds, attribution is still required. It would almost be worth subscribing to Good so that 100% of my payment could go to the non-profit of my choice, as the site promises, except I’m limited to their choices of non-profits and none of them appear to be charged with educating magazine publishers or video artists about the niceties of copyright law, intellectual property rights, or even just plain common courtesy. If that phrase doesn’t provoke a shudder of horror and loathing, it should. It’s the battle cry of the Browser Wars, those terrible and ultimately futile years at the end of the last milennium. It’s the rallying cry of those who would take the open ubiquity of the web and fragment it into a collection of gated communities, where entrance to each is predicated on running a specific browser. All too often, because developers are too fearful or prideful or just plain lazy, they put up unnecessary barriers to entrance. They prevent people from using their sites based on choice of browser. Of course there are situations where the experience will be different—nobody expects Netscape 4 users to be able to see all 2007’s pretty CSS effects, just like table-based sites look beyond bizarre in Mosaic. That’s no excuse for sites that intentionally lock users out just because their choice of browser doesn’t line up with the developer’s expectations. It’s regressive, short-sighted, and just plain unprofessional. The fact that optimizing pages for an iPhone makes the development of such specialized pages attractive in no way excuses lockout of other users. I might be willing to entertain the argument if the iPhone’s browser were some specialized non-web contraption. It’s not. It’s a full-fledged XHTML+CSS+DOM browser that happens to lag a bit in some implementation areas and won’t run some plugins. Besides, if you’ve developed a version of your site (or application or whatever) that works well on the iPhone, then why in the name of Tim Berners-Lee would you deny other people that optimized experience? You might find that they prefer to interact with the site that way no matter what platform they’re using. You might find that you don’t need a separate iPhone version after all. The iPhoned version might be the only version you need. Designers will argue that pages optimized for the iPhone screen will look bad on a desktop browser. Maybe, and maybe not, but stop preventing your users from making that decision for themselves. Nobody says you have to convert your whole site to be iPhoney. But your lockout of non-iPhone users is worse than rude. It’s stupid. We finally learned, after much sweat and a fair number of tears, that “best viewed in” is a fool’s errand. Are we so eager to rush back into that morass and fight the war all over again?